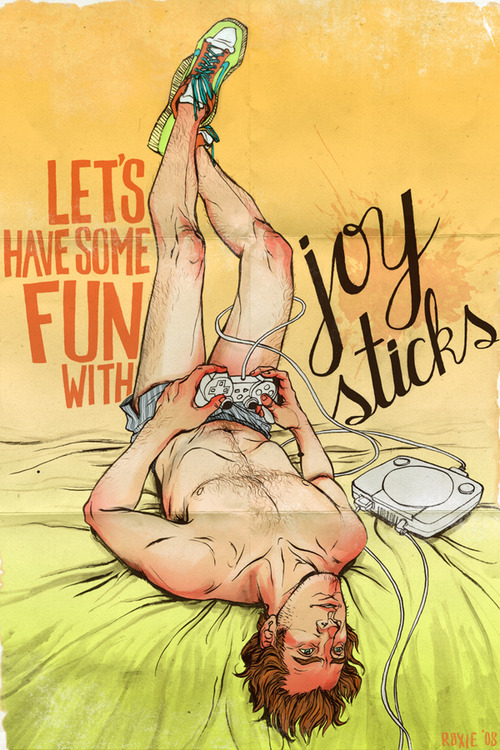 What does it say about me that the first thing I noticed about the following illustration is that the half-naked guy who I assume is supposed to serve as its focal point is playing what appears to be a PSone (one of my all-time favorite consoles)? Of course, the guy in question isn't exactly "my type," so maybe that has something to do with it. I discovered this image while perusing one of my favorite tumblrs, by the way--with that tumblr being Games With Boys. Did you know that Justin Difazzio, aka the regular commenter formerly known as viewtifuljustin, is the proprietor of Games With Boys? Well, you do now. It's true. Time to come out of the proverbial closet. It's-a-me! yay! actually i'm curious, i know you have an account on there but do you actually use tumblr? I have multiple tumblr accounts, Steve--mainly because I never can remember my usernames/log-in info, etc. I haven't really started a tumblr of my own, though. I meant to a while ago, but then I discovered keeping up with my blog and with Twitter, Flickr, etc., was more than enough for me. I love looking at others' tumblrs, though, including yours and Justin's and Video Games Made Me Gay, etc.